Extreme Action 120% (EX120) Revitalizant rebuilds, repairs, and protects engine metal in all types of gasoline and natural-gas powered vehicles, including turbocharged and supercharged engines. Extreme Action 120% repairs scratches and wear caused by high heat and friction, then it forms a protective, self-regulating layer of metal-ceramic on treated parts to protect the engine metal from future wear. Independent tests show that Revitalizant increases engine compression, increases horsepower, reduces emissions, and improves gas mileage! EX120 helps engines run smoother and last longer. EX120 is compatible with all types of motor oil, including full-synthetic. 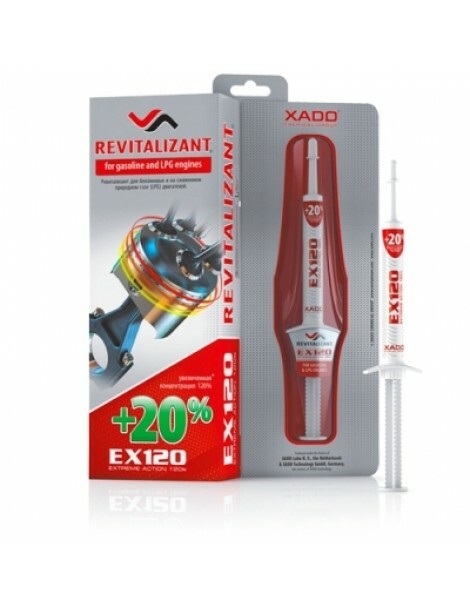 *Compared to XADO gel-revitalizant for gasoline engines.